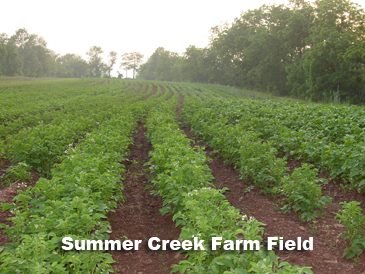 Summer Creek Farm is a 27 acre all certified organic farm owned and operated by Frederick County native, Rick Hood. His farming business began as a small truck garden in 1984. By 1992, the farm had grown and moved to its current location in 1992. Summer Creek Farm was officially USDA organic certified in 1998. Though Hood operated his farm to organic standards, actual certification wasn’t so important initially. Farmer Hood’s view of on buying local vs. buying organic is that the consumer should know the farmer and know their methods – not relying on organic certification to sell your products. Hood had developed a strong relationship with his customers due to the farm’s open door operation and maintenance policy. Hood’s philosophy is that “personal trust and relationships are more important than any certification,” Largely Mr. Hood pursued the organic certification in order broaden his market opportunities for selling grain on the organic market. Though, he acknowledges that organic certification can help the small farmer broaden their market beyond the immediate community. Establishing a one on one relationship is more difficult in the open marketplace. 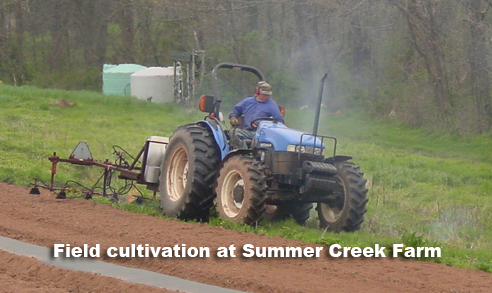 Summer Creek Farm is operated year ‘round via the hard work and ingenuity of Rick Hood. 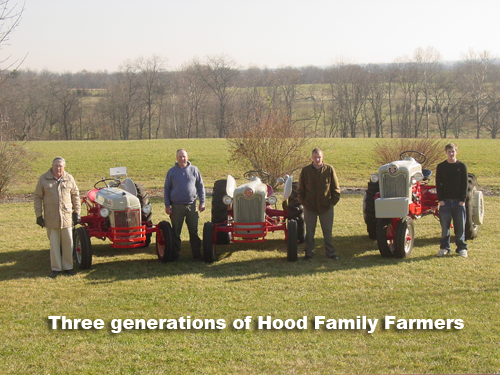 However, his sons help out on weekends and Hood has trained them to perform tasks critical to the farm operation. Without their help, Hood’s days would be even longer, if that were possible. Mr. Hood Senior is a key part of the Summer Creek Farm support system. Nearing 70, his father has his own farm nearby growing high quality Timothy horse hay. Rick says “I rely on my Dad because he is a wealth of knowledge for equipment and farming techniques – and he’s a real good problem solver.” “It’s an excellent technical/labor exchange arrangement between my father and me.” Rick helps out on his father’s farm planting, mowing and bailing hay and his Dad helps him on Summer Creek Farm with a host of problems from repairing equipment to his knowledge of agricultural systems. Mr. Hood Senior taught school for many years at Francis Scott Key High School in Carroll County. “He always wanted to go back to farming after teaching and finally began a hay business in his mid 50’s, approximately 15 years ago,” said Rick Hood. Rick Hood’s products include vegetables (over 30 types) from greens in the spring to Pumpkins in the fall. “We grow five varieties of potatoes, 5 varieties of tomatoes, green beans, asparagus, spinach, and broccoli.” “We also grow over 15 acres of small grains (Usually wheat, soybeans, barley and/or rye).” His farm’s products are available at West Frederick and Clarksburg Farmers Markets and are also sold at Common Market and Roots Markets. In-season items are featured on the menus of fine dining restaurants in Frederick such as Acacia, Cafe Nola and Volt. Summer Creek also conducts educational tours and sells fertilizers and farming supplies. Marketing is done through farmers markets, wholesale and retail outlets. Summer Creek Farm also operates a Community Supported Agriculture (CSA) subscription co-op program with 50 customers seasonally. Rick Hood is 49 years old and was raised in Frederick and Carroll County, Maryland. Interestingly, his degree isn’t in agriculture but in mathematics from Hood College in Frederick, MD. Rick didn’t grow up on a farm, but had maternal grandparents with a lumber business and a small truck farming operation. His paternal grandfather was a dairy farmer. Aside from these influences, his family also had a five acre garden that fed the family and provided supplemental income. 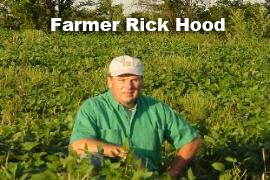 Rick has been active in the agricultural community for many years. He has served as president/chairperson on the Maryland Organic Food and Farming Association (MOFFA), the Maryland Certified Organic Growers Cooperative (MCOGC), and Frederick Farmers Markets. He has also served on the board of Future Harvest and currently serves on the board of the Frederick County Agricultural Business Council (ABC). In 1999, Hood added irrigation for the vegetable crops. “In 2002 we built our first 21’ by 96’ High Tunnel greenhouse for season extension. Since 2004, we added two more for a total of over 6,500 square feet.” In 2006, a small heated greenhouse was added as an early season nursery for their plant stock. They have also added on-farm grain storage and several support buildings at the farm to increase their sustainability. It bears mentioning that Summer Creek Farm has made considerable investments in alternative energy to supply farm activities. They have developed on-farm bio-mass heating sources, converted all off-road diesel consumption to soy-based bio-diesel. Photovoltaic cells are used to perform some minimal operations on the farm, such as power for our weather collection system, limited lighting, and fence charging. Rainwater is harvested to conserve water resources, reducing run-off as well as the offset of energy for pumping. Rick estimates that he collects thousands of gallons each year for use on the farm. In the off season, Rick hosts workshops and seminars at the farm on organic gardening, drip irrigation, composting, and for rain barrel construction and use. What has been the biggest change in your business in the last ten years? On the positive side: There is an even greater demand for locally grown food. On the negative side, there is way more regulation from all levels of government. Are you finding it more or less difficult to compete with modern supermarkets for seasonal business? It seems that as a modern farmer, you have diversified your operation to take advantage of many aspects of the changing marketplace. Was necessity the mother of invention in this instance? “Yes. I analyze cash flow monthly.” He is always looking for sales items to generate cash flow in weak months. “It’s an ongoing process. The need for diversification does not result in growing more corn and tomatoes in the season.” He is currently growing all he can handle of summer season market crops. The key is adding products that can make money in the off-season. This is why he developed poultry, eggs and rainbarrel production. He buys juice barrels and customizes them to their own unique standards. His customers appreciate his product diversity and the synergy of his business model. “As you might guess, I have many plans for the future, but little time to implement them.” Hood is always looking for new ways to extend his season and new crops to grow that will be at least as profitable as his current offerings. He began a tomato seedling operation because his seedling supplier went out of business. So, in order to grow the types of tomatoes his customers wanted, he developed a small seedling nursery. Now he has plants to supply his own farm as well as plants to sell to his customers in the spring. In the process, he developed his own potting mix and plans to put in a bagging operation next year. He is also experimenting with tomato plants for sale in hanging baskets. He say’s that he can’t keep them on the shelves.